Several security solutions are provided "out-of-the-box" with the framework, such as JWT-based authentications. Micronaut provides features such as “Token Propagation” to ease secure communication between microservices. Thanks to its low memory footprint, Micronaut is capable of running in Function as a Service (FaaS) serverless environments. 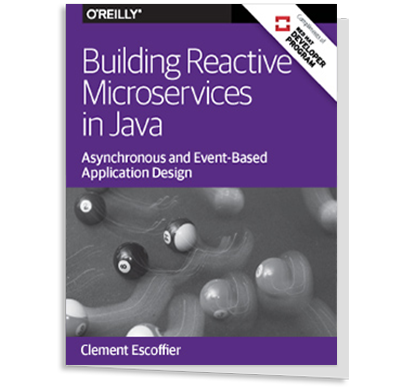 In the ﬁrst article within this series, we developed and deployed three microservices with the JVM-based Micronaut framework. In this second tutorial article we are going to add several features to our app: distributed tracing, security via JWT and a serverless function. Moreover, we will discuss the user input validation capabilities offered by Micronaut. Breaking our system up into smaller, ﬁne-grained microservices results in multiple beneﬁts, but it also adds complexity when it comes to monitoring the system in production. Micronaut integrates natively with Jaeger and Zipkin -- the top open-source distributed tracing solutions. The app is composed of three microservices. ( gateway, inventory, books) which we developed in the ﬁrst article. You will need to do these changes to all three microservices. Add the following dependencies to build.gradle to send tracing spans to Zipkin. Setting tracing.zipkin.sample.probability=1 means we want to trace 100% of requests. In production, you probably would want set a lower percentage. That is it. With minimum conﬁguration changes you are able to integrate distributed tracing into Micronaut. Let us run the app and see the distributed tracing integration action. In the ﬁrst article, we integrated Consul for service discovery into our app. Because of this, you need to start both Zipkin and Consul before starting the microservices. When we start the microservices, they will register themselves at Consul service discovery. When we engage them with a request, they will send spans to Zipkin. You can then navigate to http://localhost:9411 to access the Zipkin UI. Micronaut ships with several security options out of the box. You can conﬁgure basic authentication, session based authentication, JWT authentication, Ldap authentication etc. JSON Web Token (JWT) is an open, industry standard RFC 7519 method for representing claims securely between two parties. Micronaut ships out-of-the-box with capabilities to generate, sign and/or encrypt, and verify JWT tokens. We are going to integrate JWT authentication into our app. The gateway microservice will be responsible for generating and propagating JWT tokens. micronaut.security.enable=true turns on security and secures every endpoint by default. micronaut.security.endpoints.login.enable=true enables the /login endpoint which we will use shortly to authenticate. micronaut.security.endpoints.oauth.enable=true enables a /oauth/access_tokenendpoint which we could use to obtain a new JWT access token once the issued token expires. We conﬁgure our app to issue signed JWTs with a secret conﬁguration. Please check the JWT token Generation documentation to learn about the different signing and encrypting options at your disposal. micronaut.security.token.propagation.enabled=true means we are turning on Token Propagation. This is a feature which simpliﬁes working with JWT or other token security mechanism in a microservices architecture. Please, read Token Propagation tutorial to learn more. micronaut.security.writer.header.enabled enables a token writer which will write the JWT tokens transparently for the developer in a HTTP header. micronaut.security.token.propagation.service-id-regex sets a regular expression which matches the services targeted for token propagation. We are matching the other two services in the app. With Micronaut, you can use @Secured annotation to conﬁgure access at Controller or Controller's Action level. @Secured("isAuthenticated()") also the BookController class of both inventory and books microservices. For services inventory and books, in addition to adding a micronaut-security-jwt dependency and annotating the controller with @Secured, we need to modify application.yml to create a conﬁguration which enables us to validate the JWT tokens generated and signed at the gateway microservice. Note we use the same secret as we did in the gateway conﬁguration so that we can validate the JWT tokens signed by the gateway microservice. You can run a cURL command and you receive a 401. Unauthorized! Micronaut supports RFC 6750 Bearer Token speciﬁcation out-of-the-box. We can invoke the /api/books endpoint supplying the JWT we received in the /login response via the HTTP Authorization header. 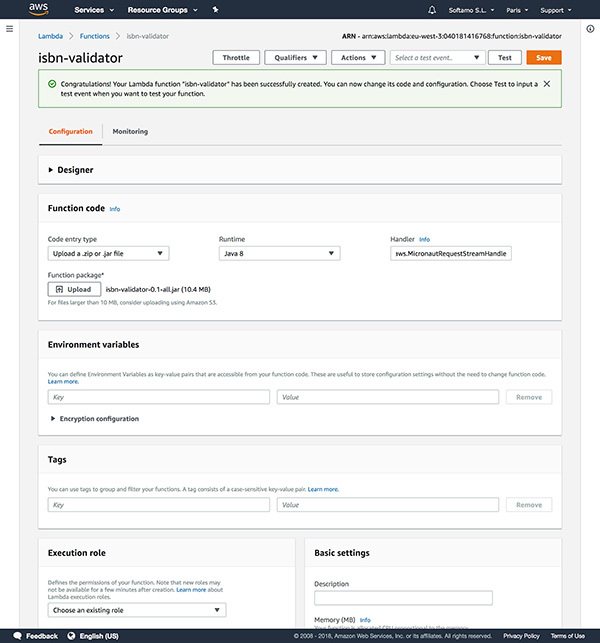 We are going to add a function deployed to AWS Lambda to validate the books' ISBN codes. Note: We used the create-function command included in the Micronaut CLI. We are going to create a Singleton to deal with ISBN 10 validation. The previous code listing contains a javax.validation.constraint. Micronaut's validation is built on with the standard framework – JSR 380, also known as Bean Validation 2.0. Hibernate Validator is a reference implementation of the validation API. * must range from 0 to 10 (the symbol X is used for 10), and must be such that the sum of all the ten digits, each multiplied by its (integer) weight, descending from 10 to 1, is a multiple of 11. * @return whether the ISBN is valid or not. As in the previous code listing, in Micronaut you will add the Validated annotation to any class that requires validation. The previous code listing veriﬁes that if we attempt to invoke the method with a eleven digits string a javax.validation.ConstraintViolationException is thrown. And returns a single result ( ValidationResponse a POJO encapsulating a ISBN Number and a Boolean ﬂag indicating whether the ISBN is valid). When we run create-function command, the Micronaut command line interface created a class located at src/main/java/example/micronaut/IsbnValidatorFunction. Modify it and implement java.util.Function to accommodate to the input and output described in the previous section. The @FunctionBean annotation is used on a method that returns the function. You can use Micronaut compile-time dependency injection in your functions to. We inject IsbnValidator via constructor injection. Modify also IsbnValidatorFunctionTest.java. We test for different scenarios (valid ISBN, invalid ISBN, ISBN with more than 10 digits and ISBN with less than 10 digits). We are ready to deploy the function. 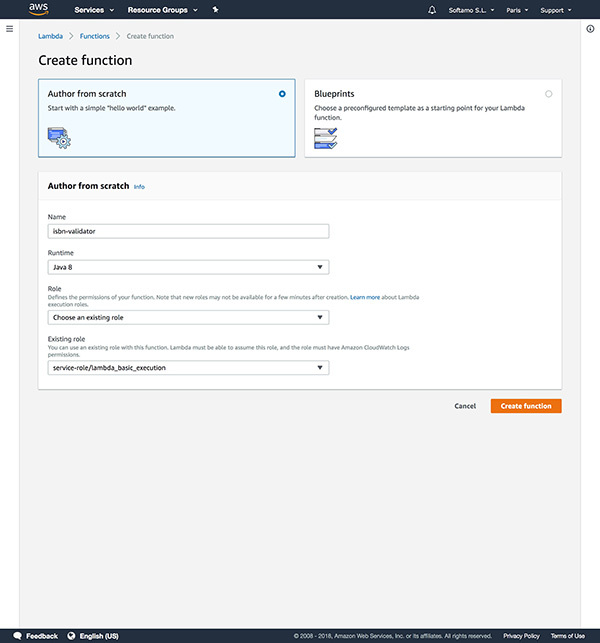 Assuming you have an Amazon Web Services (AWS) account, you can go to AWS Lambda and create a new function. Select Java 8 runtime. Name: isbn-validator and create a new role form template(s). I give the role name lambda_basic_execution. Run ./gradlew shadowJar to generate a fat Jar. shadowJar is a gradle task exposed by Gradle ShadowJar plugin. I allocated just 256Mb and a timeout of 25s. Consume the function/AWS Lambda from another microservice. The FunctionClient annotation allows applying introduction advice to an interface such that methods deﬁned by the interface become invokers of remote functions conﬁgured by the application. Use the function name isbn-validator as we did in application.yml . The last step is to modify the gateway BookController to call the function. As you can see in the previous code we are injection a bean conforming to IsbnValidator via constructor injection. Using the remote function is transparent for the programmer. We have three microservices (a Java, Groovy and a Kotlin Microservice). Those microservices use Consul for service discovery. 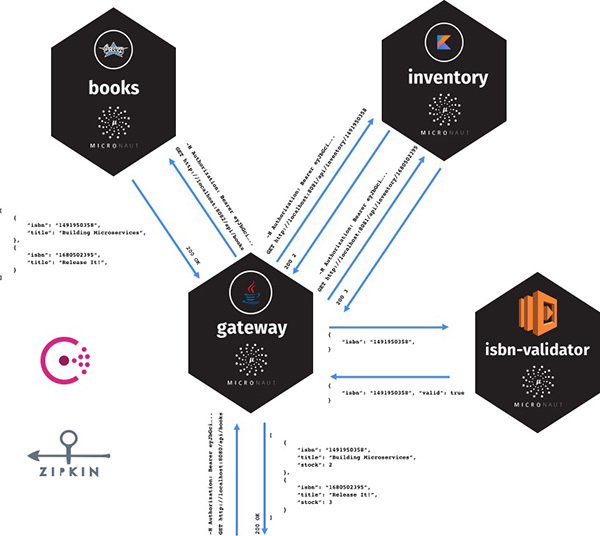 Those microservices use Zipkin as a distributed tracing service. Communications between microservices are secured. Every request allowed through the network includes a JWT token in the Authorization Http header. JWT tokens are propagated automatically through the internal requests. Please, visit the website to learn more about Micronaut. I noticed couple minor things. Hibernate Validator dependency is misspelled (micronaut-hibernate-validator). Ran into a compile error when building gateway service, adding isbn-validator as a dependency to gateway service fixed it. maybe I am missing something in my code, is this code in github? Thanks. I think I figured it, that inject error is thrown because of my linking isbn-validator module to gateway. To fix my original compile error, I need to make copy of IsbnValidationRequest, IsbnValidationResponse beans in gateway module, I was hoping to reuse it from isbn-validator module, but it conflicts with isbnValidator bean definition, which exists in both modules. Your articles are very simple and informative. I am new to Micronuat. What is the best way to connect with database tables like USER, ROLE and USER_ROLE? Appreciate your answer.